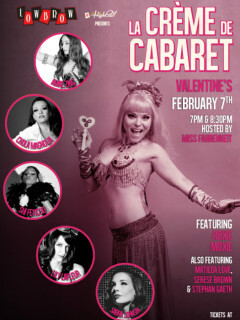 Valentine's Day is named after a saint, but you’re not likely to find many of those at Lowbrow at The Highball in February during La Crème de Cabaret. This bimonthly series brings you the latest and greatest in burlesque, comedy, dance, music, sideshow, aerial arts and more. La Crème de Cabaret will star Roxie Moxie along with host Miss Fahrenheit and special guests Amae Zing, Chola Magnolia, Lilly LaFleur, Matilda Love, Sabra JohnSin, Serese Brown, Shi Feticcio and Stephan Gaeth.